Disclosure: This review is based upon a copy provided by the publisher. No other consideration was offered. 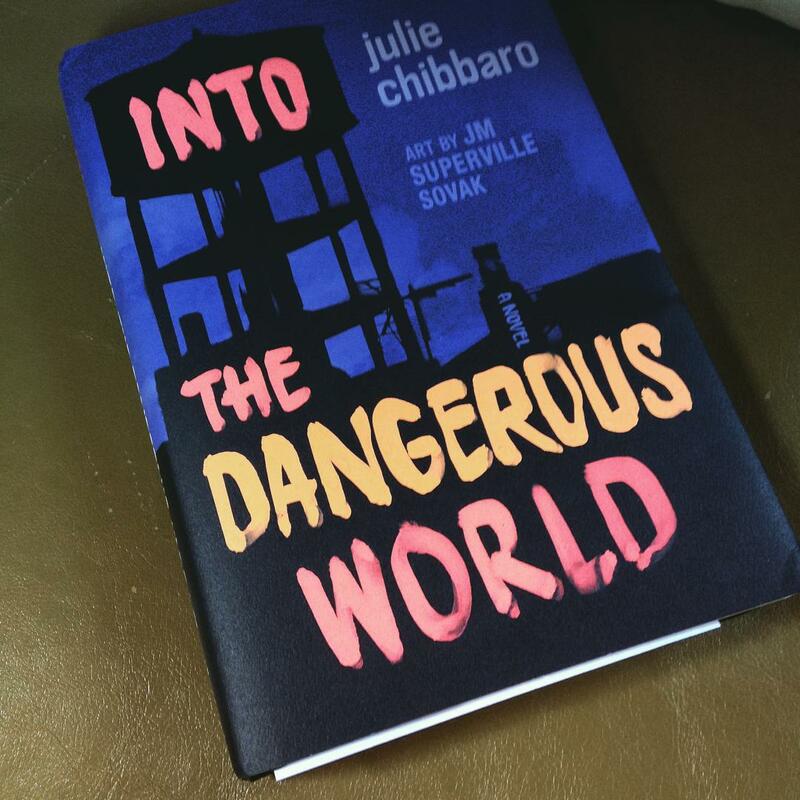 Into the Dangerous World takes the reader through fascinating layers of race and cultural identity in one of the few novels I’ve read that successfully and seamlessly interweaves prose and artwork, so that each becomes a part of the story. You can’t read Into the Dangerous World without also looking at it, and you can’t look at the art in isolation and truly understand it. This is a book meant to be both textual and visual, to be absorbed as a holistic enterprise. It’s weighty, literally and metaphorically, with sharp prose by Julie Chibbaro accompanied by her partner Jean-Marc Superville Sovak’s haunting illustrations. The story opens with a fire. Ror has lived her entire life on a strange squatter’s commune with her family, watching her father grow increasingly trapped in untreated mental illness, and when he sets fire to their home and dies in the blaze, her mother is forced to relocate the family into the heart of urban New York City. The city and its haunts are totally unfamiliar to Ror, who is used to being bounded only by her own imagination — here she has to go to school, to navigate complicated social situations, to dress and behave to blend in, to do everything that goes against the beliefs she was raised with, and, ultimately, to begin to question those beliefs as she sees what they did to her family. Ror isn’t just an outsider and a member of her own diaspora, though. She’s also an artist. Her mode of expression is deeply rooted in art, and in New York, she finds a world of it, including the compelling and mysterious graffiti that adorns every street corner, every subway car. She drinks up the strangeness and unfamiliarity of it even as she works on other art projects and fights those around her who reject graffiti as mere vandalism, not true art. When she meets a talented graffiti artist and his crew, she’s brought into an insular community of its very own, one in parallel to the one she left, and she begins to find herself again. The story in Into the Dangerous World is very deftly told, and it’s a striking commentary on art as well as urban culture in New York City — and includes some much-needed exploration of race and the intersections between class, race, and art. Ror may consider herself socially disadvantaged in many ways as a result of her upbringing and her family’s extreme poverty, but as she meets and interacts with people of colour around her, she learns that they have different complicated struggles often made more so by poverty. She also begins to pick around the edges of the fact that an art form commonly associated with the Black community is disparaged, while works associated with whiteness are not — graffiti on a wall is vandalism, splashes of paint on a canvas in a gallery are not. As a white artist, she has access to things that others do not. It’s an important reflection in an era when street art is thriving in many cities, but it’s also becoming a fraught issue. Is photography of street art still art of its own, or is it a violation of the original artist’s intent? Should we be hacking Banksys out of walls and selling them for thousands of dollars? How does the work of Banksy and other political commentators differ from its earlier roots in the graffiti movement — or, for that matter, from ancient graffiti decorating the walls of Pompeii and other historic cultural sites? What does art mean? Who is the arbiter of art? Graffiti continues to be a poorly tolerated art form and one that’s not just disparaged but actively suppressed, unless it’s santised and put in a gallery, and many of the people controlling that crossing point between art and vandalism are, of course, white. The art within Into the Dangerous World reflects these tensions. We see Ror producing work in a variety of styles as she works towards settling into herself — as the expression of who she is, the art shifts from scene to scene and other course of the book. She develops more as an artist, hones her skills, drops and adopts different forms to get at what she wants to say. The ability to draft art that evolves over the course of storytelling is no small thing, especially when it has to be meticulously paired with accompanying prose; if it’s not well done, it feels disjointed, and if it’s too well done, it feels precious and rather on the nose. Instead, it needs to work in harmony and balance, which it did. Some of the art takes the form of small, simple sketches, dashed out spontaneously in little corners of the text. At others, it’s vast, consuming worlds, entire pages, sprawling. It captures differing moods and moments in a way that text cannot always do, and it presents some interesting challenges. The art direction and editing in this text required a great deal of careful collaboration, as did the production of Into the Dangerous World overall — if it takes a village to make a book, this required a whole city of cooperative elements working together to make something that felt authentic, drawing upon the experience and skills of all the parties involved. This is not an uncomplicated book or a fast read, but it’s still well worth the trouble.